The Women’s Commission are delighted to announce a New Women’s Intermediate League for 2018. The League is aimed at bridging the gap between our Introduction League Events (Corkagh Park , Munster Lge etc) and the National League. The League will include a Leaders Jersey , and an Overall Prize List. Have you tried racing and want more experience? 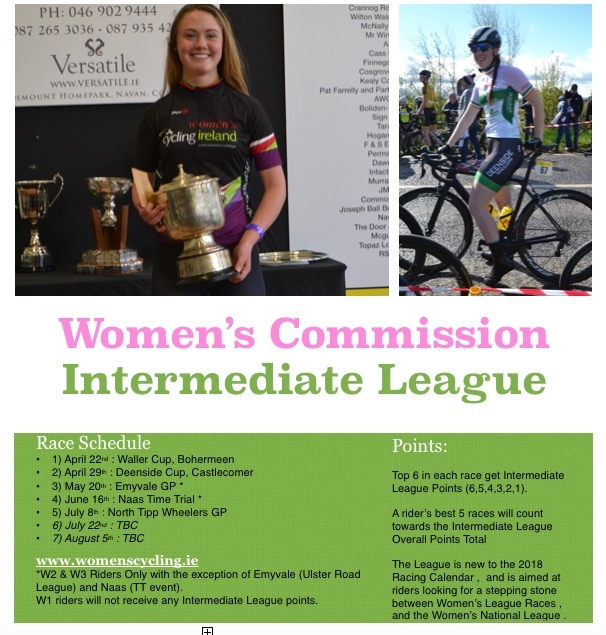 The Intermediate League is new to the 2018 Racing Calendar (Catering For W2 & W3 Riders Only) and is aimed at riders looking for a stepping stone between Women’s Beginner League Races , and the Women’s National Road Series . Medals and prize money will be presented at the final event of the League. Top 6 in each race get Intermediate League Points (6,5,4,3,2,1). The League is open to W2 & W3 Categorised riders only . W1 = A1 and A2 riders / top 10 from 2017 National Championships / top 6 overall from 2017 National Series / W2 riders who have got enough grading points during 2018 to be upgraded. W2 = A3 riders / W3 riders who have got enough grading points during 2018 to be upgraded. Any riders who wish to be Upgraded / Downgraded can make a request by email to the Grading Officer at womensracingsec@gmail.com . W1 riders cannot race in the Intermediate League (including riders upgraded to W1 mid-season). Once a rider is upgraded to W1 they stop racing in the Intermediate League, but their Intermediate League points total still remains on the Intermediate League Table and they are eligible for an overall Intermediate League prize.